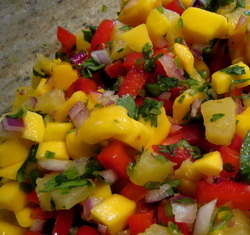 In a single book, there three very close tropical fruit salsa/relish recipes. One of them was from the Halekulani and the esteemed Chef Mavro. Then there were the 73 from epicurious and 145,000 generically from Google! Ultimately, I wanted something tropical, simple and using easily measurable units (i.e., 1 can or 1 of this). I nixed the over-fruity--no bananas, peaches or canned mandarin oranges. Finally, I narrowed onto the combination of Japanese vinegar and lime to yield the best balance. You can also swap out mango for papaya, but it must be very firm. Otherwise the papaya will make the salsa go slimy. Also, try to find the sweetest, juiciest pineapple you can. Maui Golds are my favorite--consistent flavor, and not too acidic. If using canned pineapple, drain well. Reserver some of the pineapple juice. Mix everything together and let it sit for about 30 minutes. If you want to add a little more sweetness, add some of the pineapple juice, but go slowly.